This week's focus is on Hearts, Hibs and the winter transfer window. It has been an interesting week for the Proper Football Men school of thinking and it is all down to one man. Ian Cathro is something of a myth (a term used in good faith here) - a coach whose methods turned heads in his teens, played a major development role at one of Scotland's biggest football clubs in his early 20s and has worked in three of the top leagues in Europe before turning 30. Cathro has variously been described as a "genius" by those he has worked with for his design of training drills, his analysis of teams and his methods with youngsters. He is an anomaly. 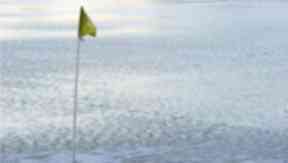 Not just in Scotland but in most countries it would be unusual to see such a young coach earn such a reputation. And more than this, he never played a single game of professional football. It is hard to argue that this fact is what has earned him a loyal band of Cathro sceptics. The Proper Football Men movement in Scotland is strong, with non-former players rarely given top jobs. When Cathro is confirmed as the new head coach of Heart of Midlothian this week it will intensify a period where he has faced pre-emptive criticism which ranges from the relevant to the ad-hominem. Stephen Craigan, a good pundit on the excellent BT Sport SPFL coverage and a promising coach in his own right with Motherwell Under-20s, became animated at the mention of Cathro. "He's never managed in his life," Craigan said in the build-up to last week's Hearts v Rangers game. "He's reported to be this unbelievable coach who is going to completely change football. "But the amount of journalists who say he's going to do something that's never been seen before - what a load of nonsense. Put him in the firing line and let's see what he's got." The following night Jamie Fullarton - a former youth coach at Bolton and short-lived manager of Notts County - took to the BBC Sportsound airwaves to decry Cathro's personality as well saying he was not a hands-on coach of Newcastle. Fellow guest Tom English had to put Fullarton right on the fact that Cathro does take first team training in Rafa Benitez's set-up. Then at the weekend it was Kris Boyd, a current Premiership player with Kilmarnock, who used a Scottish Sun column to launch a personal attack on the 30-year-old. Stemming from an encounter with Cathro on a coaching course, Boyd wrote he "knows nothing about" man-management. Boyd seemed preoccupied with Cathro's use of a laptop, writing: "People go on about one of the reasons our game is in decline is too many youngsters spend too much time on their computers. 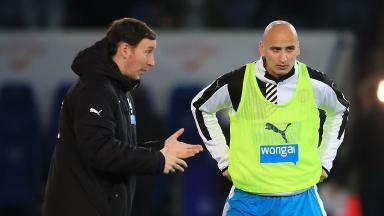 "But Cathro has shown that is maybe the best way into coaching in the modern era." From the outside this looks like a peculiar criticism when technology is enhancing the performance and efficiency of nearly every professional - including other sports such as rugby and cricket. And when you look at an article in the Evening Chronicle, a paper that knows Newcastle United better than most, you find testimony from first team midfielder Jack Colback that Cathro is on the training field and that he "takes no s**t" from the experienced players he is coaching. In his own words to the Chronicle, Cathro says: "The primary task is helping the players reach a point where they feel entirely clear and comfortable with what the manager is asking. "The players have to be convinced of how we're going to do certain things and operate in certain parts of the game. "My job is to help communicate those ideas from the manager to the players." There are valid question marks over Cathro's head - he has not been the main man in the dressing room before and any coach must make adjustments when they move up from the backroom team to become the boss. He has a reputation for being deadpan in conversation. The term obsessive has also been used. He appears to be an immersive character and he will need good interpersonal skills to be a success. When Cathro quit his Scottish FA post in 2012 he said he wanted to leave behind his youth coaching and go on the path to becoming a head coach. Knowing his lack of background in the game would hinder him, he has walked a path less-travelled to get to this point but working with top players in top leagues, in three different languages, must have taught him a few things about how to command a dressing room. This route has roused the attention of the Proper Football Men because until now you played; retired; got your badges; coached the kids; then you took over the first team. There are no guarantees Cathro will be a success but there is no place in Scottish football for further divisions. The Proper Football Men can help him succeed and he can help the Proper Football Men embrace modern methods. The opening weekend of December kick-started the real Christmas rush and with little to separate half of the Scottish Premiership, the shopping they carry out could make this the most important transfer window in years. One win separates sixth place Kilmarnock and the league's bottom club Inverness CT and with such tight margins, some winter retail therapy could be the difference between safety and relegation. The January window, a desperate one-month dash to the tills, is often seen as a time for reinforcements rather than long-term investments but some clubs have shown mid-season movement can prove incredibly fruitful. Celtic have taken particular advantage in recent years recruiting Tom Rogic, Erik Sviatchenko, Leigh Griffiths, Mikael Lustig as well as Patrick Roberts. Following a three-hour meeting with Dermot Desmond in London, Brendan Rodgers declared the runaway champions are preparing to strengthen further in 2017. Life is very different for the top flight's other sides but with the English market bloated, those on inflated wages desperate to avoid another idle six months suddenly become viable options for Scottish clubs. Lee Hodson's loan switch to Kilmarnock helped keep the Ayrshire side in the top flight and earned the Northern Ireland international a move to Rangers. Last year Danny Swanson made his successful return to St Johnstone while Hearts were shrewd in picking up John Souttar from Dundee United. January activity or lack of it can often be a fine indicator of a board's faith in coaching as well as squad health. After a poor summer, plenty of attention will be centred on Mark Warburton and Frank McParland as they negotiate what they describe as the "difficult" winter market. At last month's AGM, Dave King made it clear he has been less than impressed by the lack of impact from many of Rangers' summer recruits. The Ibrox chairman's declaration that the current squad should be good enough to secure European qualification also suggests arrivals will be at a minimum. Having opted for experience in the close season, replacing the departed Joey Barton and injured Niko Kranjcar in midfield would appear to be the priority in Govan. The new year is also a time to weigh up pre-contract agreements with up to 105 players in Scotland's top flight seeing their current deals expire this summer. With money remaining tight, the compact nature of the Premiership makes forward planning difficult and so decisions on retaining key squad members may be made later than ever. Will Dundee United further delay Hibs' delivery? If Hibs compared their time in the Championship to that of a maternity ward, they would be the tortured woman still in labour after hours of pushing to no avail. Hearts and Rangers both arrived at the same time but have since left with their reward. Hearts' process was seamless while Rangers, who may have hit some complications along the way, also managed to get out before them. Then came Dundee United - another big club falling down a division, desperate to bounce back as soon as possible. Yet another patient trying to beat Hibs out of the door. Mentally and physically exhausted at the time it has taken, the Easter Road side will be even more determined not to let the new face compound them to further misery. They want this to finally be their year but after a 1-0 defeat to Ray McKinnon's men on Friday evening the title race has been blown wide open. Level on points at the top of the table, Hibs remain ahead by a goal difference of just six. This time last year Hibs had 37 points from 15 games ahead of finishing third in the table. They were on a run of nine consecutive wins and 15 unbeaten. Their form hasn't quite matched up this time around, though. They're now six points worse off and have only won four of their last 11 games. Over those games they've scored 16 goals and conceded eight - so although they are knocking them in at one end they are also having trouble keeping teams out at the other. Dundee United on the other hand have ignored the cautious warnings that this is a rebuilding campaign and have gone on a run of 11 games unbeaten. In a league without Hearts and Rangers it was always expected to be a tussle between Hibs and United but few expected it to be so close at this stage of the season. The fact there's also a six-point gap between them and third place Falkirk emphasises just how much this could become a two-horse race.